A second OVA for Taiki Kawakami's Tensei shitara Slime Datta Ken will be bundled with the 12th volume of the manga. The volume will ship on July 9. 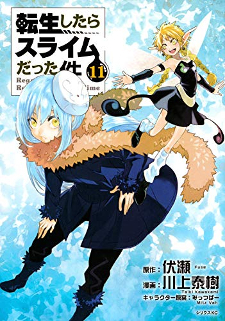 The first OVA was initially planned to be bundled with volume 11 (pictured), which released on March 29. Due to production issues, the episode was postponed and will now be bundled with volume 13 that will release in December. 8bit's 24-episode anime adaptation that aired in Fall 2018 is based on the manga adaptation of Fuse's light novel. Kawakami has serialized the manga in Shounen Sirius since March 2015. The anime will get a second season in 2020. The manga is a pretty nice read. Yay! More slime anime for me! I knew that the production had problems exactly for trying to rush the last arc.